I found quite a long time ago these cute vintage prints but can’t remember where. If you know who is the owner I beg you to leave me a comment so I can link them back to the original site. I fell in love with them and I decided to use them to do some cute pictures. I cut a piece of plywood to the size of the print. Whilst I soaked the print in water and then placed it on a paper towel to dry a little, as my friend Mayca told me, and then I applied some homemade decoupage glue (half glue half water) over the plywood. You can use Modpodge instead, it works much better for me. Then I only placed the print over and pressed with a plastic bag all over to remove any air bubbles. I really recommend the plastic bag because the print is still wet and it is much more delicate. Once it was dry I did two little holes for the wire to hang, and protected it with two layers of matte varnish. (Modpodge will work great as well). This entry was posted in Decoupage. and tagged Decoupage, DIY, Freebies, French, Printables, Vintage. Many thanks Elena for stopping by and take the time to comment!! Gracias, la verdad es las láminas son preciosas y quedan bien en cualquier sitio. The vintage signs are wonderful and I love that tip with the plastic bag. I’m going to need to try that. Thank you so much for linking up with us at Snickerdoodle Sunday! Have a great week Pili! These are very pretty, Pili! Great tip about using the plastic bags. Thank you for partying with us. Pinned and Tweeted. Those prints are just too adorable! 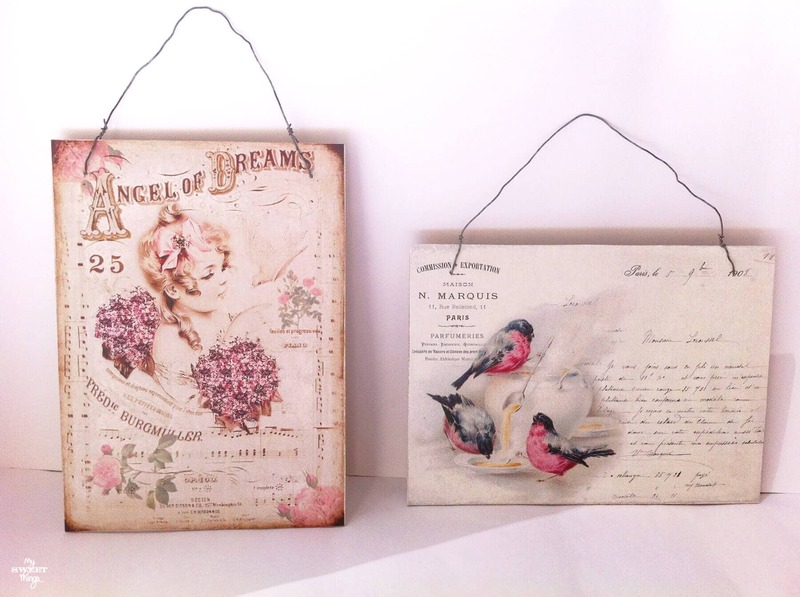 I love vintage and I love birds, they are just perfect. Your signs have turned out wonderfully.